IMPROVE is able to support any project where protein concentrates and isolates will be produced using traditional or disruptive processes and where a full characterization is needed to predict the type of food matrix in which they can be applied. 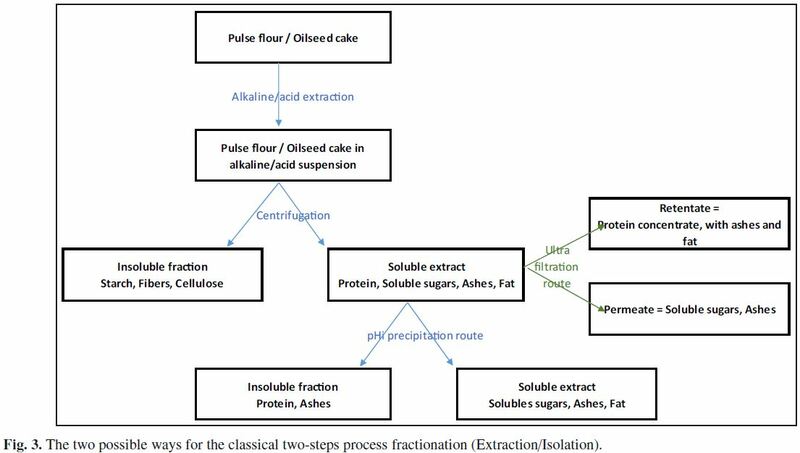 As an example of plant protein extraction, you’ll find here the two possible ways for the classical two-steps wet process fractionation (Extraction + Isolation) : fig3. alkaline solubilization of the proteins, the insoluble material (mainly starch and fibers) is removed by centrifugation. By adding hydrochloric acid to the supernatant, the protein is precipitated iso-electrically (pH 4.0–5.0), separated by centrifugation and neutralized. The co-product contains the other soluble components, mainly sugars, soluble fibers, fat and ashes (Fig. 3). – Extraction step can be performed in acidic condition (Alli et al. 1993), or in water (Klamczynska et al., 2001). Globally, if acid or alkaline extraction can lead to high level of purity (>90%), for water extraction, values are lower: 50– 65%. – Isolation step: instead of pHi precipitation (assisted with heat-treatment or not), the ultrafiltration way can be used to purify protein. This process was developed at the Food Technology Laboratory (Lyngby, Denmark) by Olsen and Andersen (1978). The main difference between the pHi and the filtration process is the solubility and functionality, generally higher in case of ultrafiltration. – A simpler wet process, derived from those described formerly, has been developed for processing pea protein by the Prairie Regional Laboratory (Canada). The whole alkaline extract is spray-dried. In this way, protein content can reach 60%. – “Micellization”, proposed by Paredes-Lopez et al. (1991) is based on salting-in salting-out phenomenon of food proteins. As reviewed by Boye et al. (2010), after extraction of protein using an appropriate salt solution at desired ionic strength, the solution is diluted, inducing protein precipitation that can then be recovered by centrifugation or filtration, followed by drying. Purity of 88% was achieved but there’s no industrial reality today, because of the high consumption of water. – Physical ways: adapted granulometry (100–150 μm) thanks to milling permits to decrease the proportion of extract remaining in the starchy by-product up to 25%. Highpressure homogenization or ultra-sound pre-treatment also can be used. – Chemical ways: pre-hydrolysis with cellulase can help to liberate protein corpuscles from starch granules. Fermentation can also be a way of functionalization of the concentrâtes obtained further. – Use of alternative solvents as supercritical fluids, alcohols, aqueous mixes (Bardeau et al., 2015; Phan et al., 2009; Russin et al., 2011; Sicaire et al., 2015). – Use of new technological approaches as enzymes cocktails (Rosenthal et al., 1996) or ultrasounds (Vilkhu et al., 2008). Globally, industrial production of protein concentrates/isolates already exists since early 50ies for soy and were industrialized later for pea and lupine, mainly on a two-steps process scheme (Extraction/isolation). The next generation will clearly be the industrial implementation of the rapeseed and sunflower protein production, and an important research effort is needed on alternative way for oil extraction as mentioned above. Of course, each production plant possesses its specificity. Industrial equipment choice will have a strong impact and each step is optimized according to the raw material and the (yieldpurity- functionality) equation. – Process of particle size reduction, which crushed, grind or mill particles at a targeted particle size and shape. – Fractionations processes that separate particles according to a given physical properties: size, density, aerodynamically properties, and electrostatic properties. 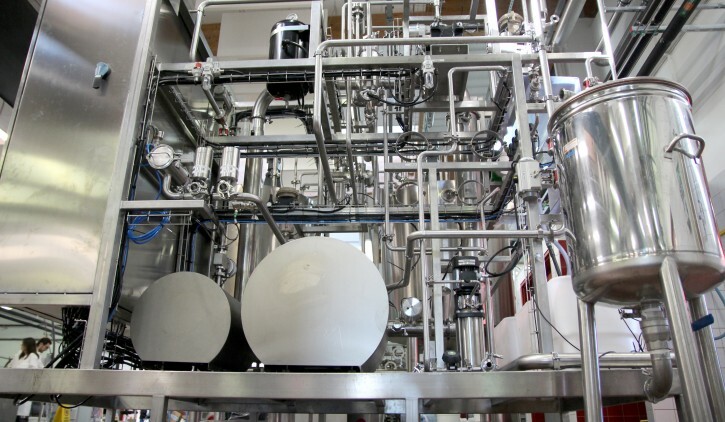 Dry processes are able to produce particles optimized for molecule extraction, mixing with other ingredient, enriching the product in a compound (e.g. proteins, starch. . . ), reducing the content of unwanted or molecules (minerals, antinutritional factors) or maximizing the bio-availability of the substrate (biological or enzymatic processes). The particle size is the main parameter to adjust and 3 categories are generally described: Coarse milling (>500 μm), fine milling (50 to 500 μm) and ultrafine milling (<50 μm). The particle size and shape are therefore important parameters to be adjusted specifically considering the application, the resources concerned and the economical balance of the process (Tab. 5). Coarse milling generate particle size higher than 500 μm. This process is adapted to break material structure according to their morphological differences. Since plant organs have strong compositional differences because of their role in the plants (protection, storage, . . . ), coarse milling generate easily particles of different composition.After crushing, particles can be separate mainly by sieving and air classifying processes. These processes can be applied for every material including soy, pulses or meal. On pulse or soy, this particle size reduction is classically used for dehulling processes. The aim of these processes is separate the hull of the resource from the endosperm in order to remove many antinutritionnal factors, fibers or abrasive fraction (silica) while enriching the product in protein content. Coarse milling can be applied to meals for particle desagglomeration after oil extraction. In that case no separation device is required. Coarse milling are extensively used at industrial scale since it’s energetically cost is low and it’s appropriate to reduce resource volume and removal unwanted compounds. Fine milling generate particle which size is comprise between 50 and 500 μm. This particle size reduction break resources according to their histological structure (tissues). Because of the different role of the tissues in the plant, the particles generated by a fine milling have different compositions. After milling, sieving processes are the process generally applied. Because of aggregation effect, the sieving must be assist with aids such as chains or balls for few 100 μm sieves or ultrasound for very small sieves. This range of particle size is classical for most of the wet extraction process since it generally represent a compromise between energy cost and surface area generated (Schutyser and van der Goot, 2011). With oily product, this level of particle size reduction generate free lipids that limit strongly the process. The soy is therefore difficult to mill finely if oil is not extracted. Meals are processable if lipids have been properly removed. Pulse are easily grind and can produce easily flours for wet extraction for examples (Boye et al., 2010). Fine milling are extensively used at industrial scale on a target of compromise between energetical cost and powder functionality. Ultrafine milling generate particle size lower than 50 μm. These process breaks material structure at a cytological scale (plant cells) (Boye et al., 2010). Because of the high level of material disintegration, the energetically cost is extremely high (Schutyser and van der Goot, 2011). The energetically cost must be counter by a significant gain of particles functionality. The powder generated can be treated by air classifying that provide a cut point of a few micrometers or by electrostatic separation that separate particle according to their electrostatic charges and consequently their composition. Air classifying is particularly adapted to pulses to create fraction enriched in protein. It generate a heavy fraction rich that contain the particles which size is higher than 20 μm, which correspond to starch granule, while generating a light fraction with particle lower than 5 μm which is rich in proteins (Pelgrom et al., 2013). These process can easily double the protein of pulses (Pelgrom et al., 2014; Pelgrom et al., 2013). Oily product such as meal or soy cannot been treated by air classification since ultrafine particle size reduction generate free lipids. Recent development have been performed to use air-classifying on oily product such as lupine, by the use of flowability aids (Pelgrom et al., 2014). Electrostatic separation have been historically developed on minerals and then transpose to cereals (Schutyser and van der Goot, 2011). Recent work transpose this technique to meal in order to enriched the protein content (Barakat et al., 2015) to create two fractions of respectively 5% and 49% of protein content.